I am composing this message on August 11th 2012, and set this message to be auto-posted on December 21st, 2012 at 11:11 EST. 5125 years ago on August 11th 2012, the first cycle of the Mayan Long Count Calendar started ticking, on August 11 3114 BC. The 12th cycle of the 144,000 day Long Count just completed at December 21st, 2012 at 11:11 AM EST (The moment this should have appeared if the world did not end). Did the world end, and you are the only one left to read this? Does Internet still exist? Did the New Madrid Seismic Zone cut the US in half in October with a 7.7 or grater magnitude quake? Was there a new Carrington Event? Did the Dollar Die? Was there a good October Surprise? Was there a presidential election? How are you spending your End of the World day today? The Star Trek Tricorder inches closer to reality. Lab on a Chip journal recently published an article, A personalized food allergen testing platform on a cellphone , dubbed the iTube (Are you getting to hate these meaningless 'i's as I am?). Abstract: We demonstrate a personalized food allergen testing platform, termed iTube, running on a cellphone that images and automatically analyses colorimetric assays performed in test tubes toward sensitive and specific detection of allergens in food samples. This cost-effective and compact iTube attachment, weighing approximately 40 grams, is mechanically installed on the existing camera unit of a cellphone where the test and control tubes are inserted from the side and are vertically illuminated by two separate light-emitting-diodes. The illumination light is then absorbed by the allergen assay that is activated within the tubes, causing an intensity change in the acquired images by the cellphone camera. These transmission images of the sample and control tubes are digitally processed within 1 sec using a smart application running on the same cellphone for detection and quantification of allergen contamination in food products. We evaluated the performance of this cellphone based iTube platform using different types of commercially available cookies, where the existence of peanuts was accurately quantified. This automated and cost-effective personalized food allergen testing tool running on cellphones can also permit uploading of test results to secure servers to create personal and/or public spatio-temporal allergen maps, which can especially be useful for public health in various settings. We all know from watching the news that to be a politician at least one of the Seven Deadly Sins of Mankind must be the driving force in the politicians life. 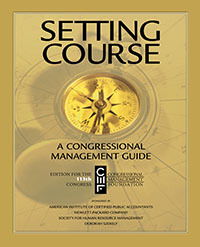 Setting Course A Congressional Management Guide by the Congressional Management Foundation, and the New Member Resource Center: Helping Members-Elect Successfully Transition to Congress . There is also the Members' Handbook put together with your tax dollars. The first quarter 2013, Volume 15 Issue 1, issue of Software Quality Professional from the American Society for Quality has a couple of articles on the state mandated licensing of software engineers, that I have been chronicling. A Principles and Practices Exam Specification to Support Software Engineering Licensure in the United States of America (PDF, 142 KB) by Phillip Laplante, Beth Kalinowski, and Mitchell Thornton, along with some Supplementary Material (PDF, 483 KB). Software Quality Professional has published many open access articles over the years, alas these are not among them, you must be a ASQ member to read them, this only serves to reinforce my view that this whole licensing issue is all about making money for those that sell training material. Summary: In April 2013 several states in the United States will require licensure for certain individuals who are involved in the creation of software that can affect the health, safety, and welfare of the public. It is expected that eventually, all states and jurisdictions in the United States will require such licensure. Each state has different licensure criteria, but all include certain educational and experiential requirements, passing two tests, with one being a common test of engineering fundamentals, and the other a test of minimal competency in relevant areas of software engineering knowledge and practice. While the common test of engineering fundamentals exists, the software engineering examination does not. In order to develop this examination, the authors conducted a study using a multimethod approach in identifying the professional activities and knowledge/skills that are important to the competent performance of software engineers who serve the public. In this article the authors describe the study, the results, and the test specification that was derived. Demographic information for the survey respondents is also presented. I'll summarize some of the highlights. The article opens by telling us that many engineers are exempted from licensure such as industrial or government entities. This reinforces what I said in my first article, this is about killing off the independent contractors and those with no formal degrees (Maryland does have a non-degree path to licensing, and other states will recognize Maryland's license). Also the information that I have gathered and posted about what each state is doing is up to date, where the cited material in the article is from 2010. Those categories were deemed the most important of those surveyed from IEEE-CS and IEEE USA, of which only 323 people participated. Apparently few to none of those returning the survey are doing firmware nor Embedded Systems. We need to have more representation in those groups? Personally I aways find it troubling that groups that I have no representation in are creating rules that affect my life. On the other hand I personally have no desire to participate in nor support such groups. "The best way to avoid problems is to practice title abstinence." - What Do You Mean I Can't Call Myself a Software Engineer? by John R. Speed. The supplemental material goes into detail about the demographics of the survey respondents. Finally, there is controversy as to the need for professional licensure and it is possible that those who disagreed with the need for licensure opted out of the survey upon receiving an invitation, thus biasing the results somehow. The Institute for Software Excellence 2013 (Indianapolis, May 6-8), sponsored by the ASQ Software Division, is planing to have a session on the professional licensing topic presented by Professor Laplante. The ISE website has not been updated as I write this with the exact details. Defense Advanced Research Projects Agency (DARPA) starts the DARPA-SN-13-07: VET - Vetting Commodity IT Software and Firmware program and announces upcoming Proposers' Day on December 12th. allow a remote attacker to take control of an affected device. If you are printing Classified Documents, or documents that your competitor would really like to see, can you be sure that your printer is not spying on you? Point your web browser at your printers IP address and you might find there is a web server running there that you knew nothing about. How would you check your printer for such a backdoor? Now how would you check millions of different devices for possibly millions of different ways of exploiting the device? This is the challenge facing the DoD. They need an automated way to vet devices to prove that no such backdoors exist. I covered this to some degree a couple of years ago in Killed by Code: Software Transparency in Implantable Medical Devices . Making source code available for independent audits is one approach (admittedly a bit self-serving as I do such audits on occasion), but that method does not scale to the number of devices in question. What would you do, is what the DoD wants to know? "DoD relies on millions of devices to bring network access and functionality to its users," said Tim Fraser, DARPA program manager. "Rigorously vetting software and firmware in each and every one of them is beyond our present capabilities, and the perception that this problem is simply unapproachable is widespread. The most significant output of the VET program will be a set of techniques, tools and demonstrations that will forever change this perception." Defining malice: Given a sample device, how can DoD analysts produce a prioritized checklist of software and firmware components to examine and broad classes of hidden malicious functionality to rule out? Confirming the absence of malice: Given a checklist of software and firmware components to examine and broad classes of hidden malicious functionality to rule out, how can DoD analysts demonstrate the absence of those broad classes of hidden malicious functionality? Examining equipment at scale: Given a means for DoD analysts to demonstrate the absence of broad classes of hidden malicious functionality in sample devices in the lab, how can this procedure scale to non-specialist technicians who must vet every individual new device used by DoD prior to deployment? Anyone up for a Road Trip to Arlington, VA for the Proposers meeting? Note that DARPA is a secure facility. Visitors should arrange an appointment with a program manager or other DARPA staff prior to visiting. One commenter suggested that the listing rule is overbroad because it includes virtually all types of medical devices in the tax base. The commenter requested that the final regulations narrow the definition of a taxable medical device so that the excise tax is imposed only on devices that Congress specifically intended to subject to the tax. The final regulations do not adopt this suggestion. Numerous commenters suggested that the IRS apply the constructive sale price rules with flexibility and sensitivity to data limitations that medical device companies face. The IRS and the Treasury Department recognize that the medical device industry will likely face some implementation issues when the medical device excise tax goes into effect on January 1, 2013, and the IRS intends to work with stakeholders on compliance-related issues, such as the determination of price. One commenter requested clarification on whether the licensing of software that is a taxable medical device is a taxable event. Under existing chapter 32 rules, the manufacturers excise tax generally attaches upon the sale or use of a taxable article by the manufacturer. The lease of a taxable article by the manufacturer is considered a sale. Neither the existing chapter 32 rules nor the final regulations address the issue of whether the licensing of a taxable article is a taxable event. However, the IRS and the Treasury Department will issue separate interim guidance along with these regulations to address this issue. Several commenters suggested that the semimonthly deposit requirements under section 6302 are burdensome to medical device manufacturers because device manufacturers have little or no experience with returning and paying federal excise taxes and because manufacturers need time to develop their systems to implement these final regulations...Given that the tax goes into effect on January 1, 2013, the IRS and the Treasury Department will issue separate interim guidance along with these regulations that addresses penalties under section 6656. The job killing tax, part of the Patient Protection and Affordable Care Act , has already been taking its toll this year. It may hit the Cleveland/Pittsburgh area hard. Resume anyone? "A Methodological Framework for Software Safety in Safety Critical Computer Systems"
The Journal of Computer Science is frequently overlooked in the Embedded Space for the solutions to many problems, for example the September issue covered topics as diverse as, Speed Control of Switched Reluctance Motor Using New Hybrid Particle Swarm Optimization for the hardware types and among us, and Fuzzy Cost Enabled Cluster Based Multipath Routing Algorithm for Mobile Ad-Hoc Networks for those putting together the latest sensor net. Of particularly interest to me is A Methodological Framework for Software Safety in Safety Critical Computer Systems [PDF] by P. V. Srinivas Acharyulu and P. Seetharamaiah. These authors have put together one of the best introductions to issues related to the safety of systems controlled by software, from defining the terms to building a model system out of a real model train set to demonstrate the techniques described. "Software safety must deal with the principles of safety management, safety engineering and software engineering for developing safety-critical computer systems, with the target of making the system safe, risk-free and fail-safe in addition to provide a clarified differentaition for assessing and evaluating the risk, with the principles of software risk management. Problem statement: Prevailing software quality models, standards were not subsisting in adequately addressing the software safety issues for real-time safety-critical embedded systems. At present no standard framework does exist addressing the safety management and safety engineering priniciples for the development of software safety in safety-critical computer systems. Approach: In this study we propose a methodological framework involving safety management practices, safety engineering practices and software development life cycle phases for the development of software safety. In this framework we make use of the safety management practices such as planning, defining priniciples, fixing responsibilities, creteria and targets, risk assessment, design for safety, formulating safety requirements and integrating skills and techniques to address safety issues early with a vision for assurance and so on. In this framework we have also analysed integration of applicability of generic industrial heirarchy and software development heirarchy, with derived cyclical review involving safety professionals generating a nodal point for software safety. Results: This framework is applied to safety-critical software based laboratory prototype Railroad Crossing Control System (RCCS) with a limited complexity. The results have shown that all critical operations were safe and risk free. Conclusion: The development of software based on the proposed framework for RCCS have shown a clarified and improved safety-critical operations of the overall system peformance." Do keep in mind it is an introduction, a real Rail Road Crossing Control System (RCCS) would be made from two or more systems running parallel, using different processors, different hardware developed by different teams in different languages such C and ADA. The real fun part is developing a system that must run for a few decades and not the eighteen month life span for many components today. I have been covering how the Government is getting involved in writing firmware in a couple of past blogs. Two more States have responded to my questions. The state of Idaho previously said they would send me a formal written letter with their response. I now have that in hand as you can see below. While the nostalgia of a formal letter is nice, was it really required when a email would have done? At its meeting on September 5 and 6, 2012 the Idaho Board of Licensre of Professional Engineers and Professional Land Surveyors reviewed the email inquiry about licensing of software engineers which you submitted to David Curtis dated August 5, 2012. You have raised some interesting question which the Board has voted to take under advisement and study. We will communicate with you further after we have had the opportunity to determine how we will handle the issues. At this week's Board meeting, the members reviewed and discussed your email below. Your questions about the exam should be referred to NCEES (www.ncees.org). The requirements (education, examination and experience) are all on our website at www.pepls.state.ms.us; look at Initial PE licensure requirements. These requirements are set by both Mississippi statutes and by Board regulations. If a person passes the NCEES Software PE exam in Mississippi, then the person would be a licensed Professional Engineer in this state. The license expires every Dec. 31; the current renewal rate is $35 and 15 hours of continuing education every year. Regarding the use of the title "engineer", Mississippi statute 73-13-39 restricts this title to those who are licensed Professional Engineers. When it comes to the Board's attention that an unlicensed person is using this title in a public manner, such as to to solicit business, to claim credentials or to certify something, the Board is compelled by state law to direct the person to cease and desist.